Actions speak louder than words. We have all heard of this saying. But it has never been truer as in the case of Customer Support Process. The success of a customer support process is dependent on measuring the right KPIs and getting relevant reports. Tracking these KPIs and analyzing these reports allows the supervisors to make effective strategic decisions. Today we will be looking at some of the aspects which can be improved with Helpdesk reports and dashboards. Some of the benefits of having the right reporting and measuring tools are as follows. Actions speak louder than words. We have all heard of this saying. But it has never been truer as in the case of Customer Support Process. The success of a customer support process is dependent on measuring the right KPIs and getting relevant reports. Tracking these KPIs and analyzing these reports allows the supervisors to make effective strategic decisions. Let us look at some of the aspects which can be improved with Helpdesk reports and dashboards. Some of the benefits of having the right reporting and measuring tools are as follows. As a business, you must be supporting various communication channels to allow the customers and prospects to connect with you on any medium. But how do you decide which channel should you focus on? Which channel has higher ROI compared to others. All these questions can easily be answered with the channel-specific reports. These reports will help the decision makers to monitor the overall channel coverage and their effectiveness. Post this analysis, the supervisor can decide which channels require an influx of resources and where the costs can be cut-off. Monitor the agent productivity along the metrics using real-time dashboards which give a snapshot of the overall operations of the customer support process. The supervisor can look at real-time information such as how many agents are available at the moment, how many are on break and how many are currently working on the assigned tickets. Additionally, the agent productivity report also provides an understanding of the efficiency and adherence shown by the agents in the completion of the assigned tickets using parameters such as the volume of work assigned, the number of tickets transferred and/or the number of tickets picked proactively. Using these reports the supervisor can draw inference on the ticket achievement or the success rate. The best way to deliver exceptional customer support is to set strict Service Level Agreements (SLAs). Though the work does not stop there. For continuous improvement, one needs to track these SLAs at the process and campaign level. The dashboards provide a graphical representation of real-time data allowing the supervisor to make spontaneous yet productive decisions. With helpdesk reports, create SLA reports for the process, campaign, and queue, monitor the areas that require improvement and keep setting stronger SLA targets to deliver a refined customer service experience. Categorize the tickets based on configurable parameters – campaign (sales, support), the status of the ticket (open, pending or closed). This will allow the supervisor to discern which types of tickets do you get the most. Based on this information, the supervisor can effectively shuffle the resources and streamline the process. The good news is, it’s not one size fits all type of a situation – the supervisor can customize the fields of the reports according to the business needs for effective decision making. A customer support process is deemed to be successful when the ticket escalation rate is within the acceptable range according to the business standards. But, how do you monitor these escalations? By getting its report. Having this data at their disposal, the supervisors can identify the problem areas or possible bottlenecks to rectify them. Automate the report delivery to the selected stakeholders and ensure everyone is kept in the loop. Opt for certain reports (can use the templates as well) to be emailed to the target recipients such as the department head, supervisor, accounts to pass on the right information to the stakeholders. The reports can be scheduled to be delivered at a specific time at the end of the day to give the supervisor to go through them and plan the next day or week’s activities. 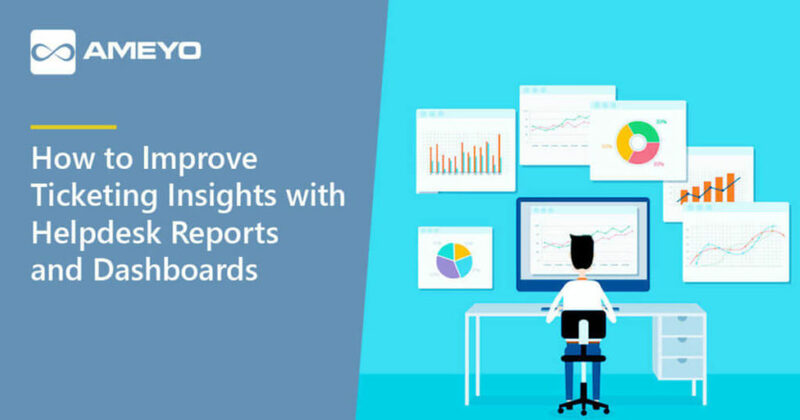 Unlike dashboards, which are most suitable for live monitoring, with reports it is possible to analyze the past performance as well. This becomes even more relevant and easy when you can customize the reports for the important metrics. Slice and dice the reports to view only the data which is needed rather than being overwhelmed by information overload. The supervisor can choose which fields are needed in a specific report based on the business goal or the department to which it is going to be delivered. For example, accounts department will only need the report about the percentage achievement for incentive calculation whereas, a supervisor will need to look at all the aspects of ticketing operation – ticket volume, number of pending tickets, average ticket handle time, to name a few. Additionally, by making customized templates, the Customer Support Head can ensure consistency of KPIs along with saving the effort on creating a report every time. It is possible to create multiple templates and keep them for future use. The supervisor can apply the filters on the list of report templates easily find and use them. With the right measuring tools at their disposal, the supervisor and department heads are empowered with correct information to make the right decisions and foresee trends. Based on that insight they will be in a much better position to make strategic decisions which will yield good results. Having smooth ticket management powered by helpdesk reports and dashboards will lead to enhanced visibility of the KPIs, the overall ticket volume inflow for better resource management that will eventually equip the leadership to be prepared for any fluctuations or unforeseen situations. It all comes down to the fact that once you allow the data to guide your decisions, it refines and improves the customer engagements. Next postWhy Adoption of Cloud Contact Center Is Increasing? What is a Help desk Ticketing System and Why is it Important?